Transcriptional mechanism of the circadian clock. Bmal1 and Clock heterodimerize to positively regulate expression of the Period (per) and Cryptochrome (cry) gene families, as well as the retinoic acid orphan receptor (ror) and Nr1d1 (rev-erbα) genes. Per/Cry inhibit Bmal1/Clock action to repress their own transcription, whereas ROR and Rev-erbα mediate opposing action on bmal1 gene expression. Expression of the Clock protein is constitutive in many tissues. Bmal1/Clock action is mediated through binding of E-box response elements (CANNTG) in the promoters of target genes. 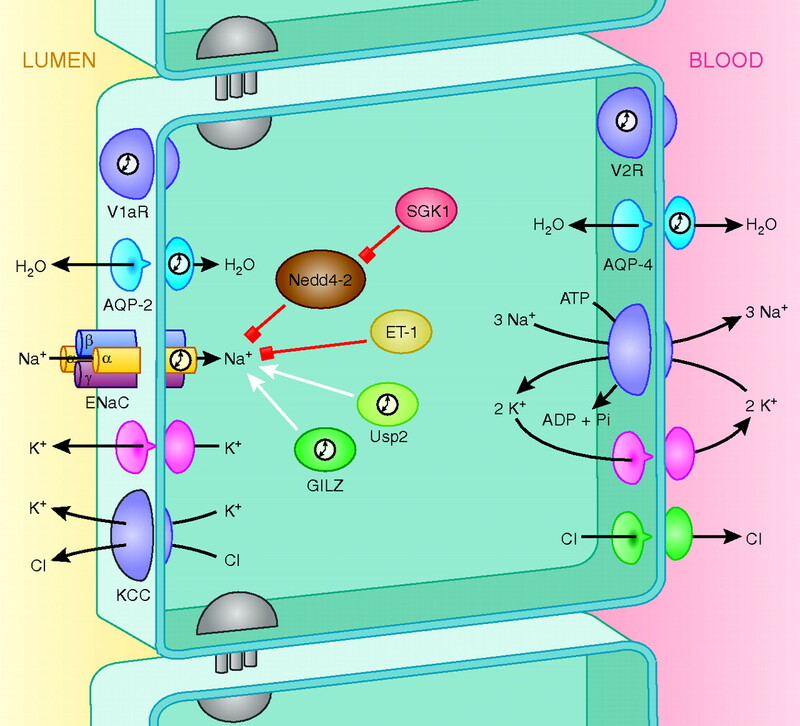 Mechanisms of sodium, potassium, chloride, and water transport in a cortical collecting duct principal cell. Proteins denoted by the symbol are the products of genes that are expressed in an apparent circadian pattern. Na+, sodium; K+, potassium; Cl−, chloride; H2O, water; ENaC, epithelial sodium channel; GILZ, glucocorticoid-induced leucine zipper protein; Usp2, ubiquitin-specific protease 2; SGK1, serum and glucocorticoid-regulated kinase; ET-1, endothelin-1; Nedd4–2, neural precursor cell expressed, developmentally downregulated gene 4-like; V1aR, vasopressin 1a receptor; V2R, vasopressin 2 receptor. bHLH, basic helix-loop-helix; DCT, distal convoluted tubule; CNT, connecting tubule; CCD, cortical collecting duct. DCT, distal convoluted tubule; CNT, connecting tubule; CCD, cortical collecting duct.